Home Nasdaq KFTX Fintech Index Fintech Quietly Off 1% Last Two days; Markets Drift. Fintech Quietly Off 1% Last Two days; Markets Drift. Sleeping and sliding. Once again boredom has taken over the markets. Soft opening, little enthusiasm throughout the morning followed by drifting lower late in the day. Buyers are comfy and the sellers are softly moving out. Be very quiet and DO NOT scare the sellers (or wake the sleeping buyers) or things could get freaky and turn the robot’s on switch on. In the fintech sector it was even quieter. 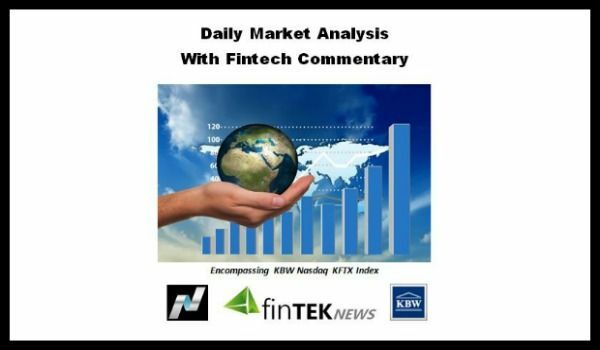 The KBW NASDAQ fintech index (KFTX) sunk down 4.86 points (-0.43%) to finish the day at 1137.72. If anyone noticed that’s about a 1% decline in the first 2 days this week. Just saying. KFTX market breadth has turned negative by at least 2:1 decliners over advances (16 up, 32 down and 2 unchanged) which was even worse yesterday. Again, just saying. Again, like yesterday, there were no (0) stocks in the 50 stock index that moved 2 points and/or 3% today. So we’ll go with the group; who cares. Unless tomorrow’s ADP and Friday’s NFP employment numbers are a big outlier and spook the markets expect this market “action” for the rest of the week. Have a nice evening.